Humanity has known the quince for 4000 years. Reason enough to devote ourselves to creating this delicious fruit vinegar. For the production of quince vinegar, as with our other fruit vinegars, 100% is obtained from the fruit itself - nothing else. 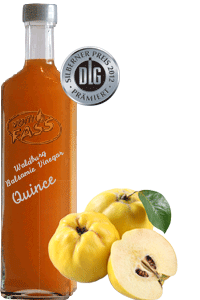 Your dishes and your guests will love the fresh aroma of the quince, paired with the acidity of the vinegar!